Babe Ruth was one of the league's most prolific hitters. Ruth was a mainstay in the Yankees' lineup that won seven pennants and four World Series titles during his tenure with the team. In 1936, Ruth became one of the first five players elected to the Baseball Hall of Fame. Ted Williams played 21 seasons with the Boston Red Sox, twice interrupted by military service as a Marine Corps pilot. Nicknamed The Kid, the Splendid Splinter, Teddy Ballgame, and The Thumper, he is widely considered one of the greatest hitters ever. Williams was a two-time American League Most Valuable Player (MVP) winner, led the league in batting six times, and won the Triple Crown twice. He had a career batting average of .344, with 521 home runs, and was inducted into the Baseball Hall of Fame in 1966. 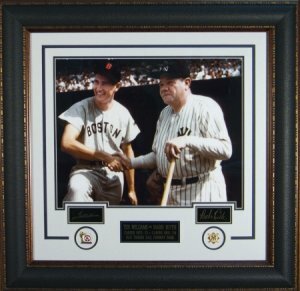 This is a Babe Ruth and Ted Williams custom premium framed unautographed Signature Engraved oversize 27x39 piece. FEATURING THE ENGRAVED SIGNATURES OF Hall of famers Babe "Bambino" Ruth and Ted "The Splendid Splinter" Williams.